After not using it for a long time, and being one to give products a second chance, I applied this on my skin and remembered what It was I disliked about it. First the smell is plastic-like, it smells like school glue. Second, it goes oily on the skin, it's like the products separates into the colour part and an oily component. I've used this in my paler moment (and trust me, during the no-sun months I'm borderline transparent) and it was still too light on me. and I know that bb creams only have two or three shades because they are sheerer than a foundation, but this one was rather thick other than sheer. Another of the 9-in-1 things I noted didn't happen was the "smoothes" and "minimises pores" ones, I could see all of my pores and imperfection like I was looking trough a magnifying glass. It just brought out the worst of my skin, instead of concealing it. Another thing is, because of the oily texture, it's rather hard to blend other cream products (such as concealer) because they don't stay where you put them. I find that, t put any sort of blush or bronzer, I had to powder it quite a bit (which is, in no way, good for your skin). The only one of this "results" I might budge for is the "brightens" one, but I accredit that to the fact that it's more of an oily formula. I'll conceal for on thing, even though I didn't like the product at all on my skin, when I removed it (and in the following days) I didn't feel like it had broke me out or anything. My skin was just as before, which usually doesn't happen with a moisturising formula (as I have very oily skin). I know that rimmel has brought out some new matte formulas for their BB creams, and I might give them a go. But, for a first experience with BB creams, this was a complete let down. Maybe if you have dry or sensitive skin this would be a good product for you, but if you have the slightest of combination to oily skin, I recommend you stay clear of this one. Well at least you didn't get blemishes with this bb cream. It's probably not made for oily skin. Have a great Woman's day! Often some creams make these jokes. 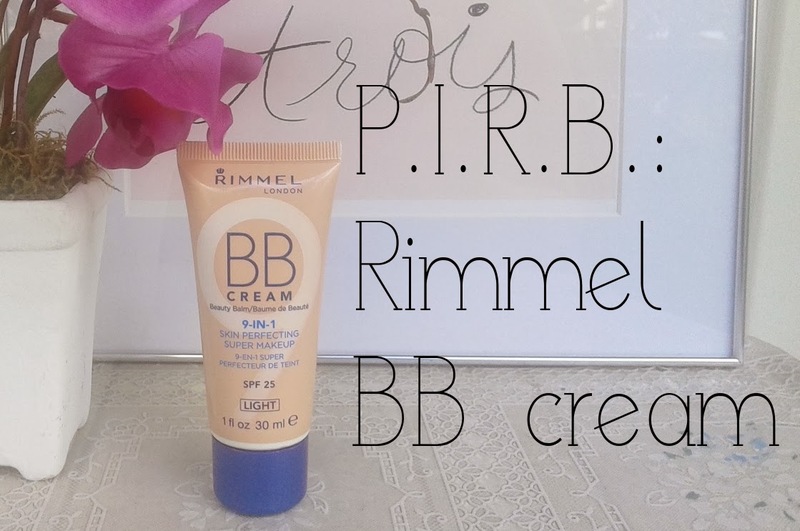 The BB Rimmel do not know personally, but some of my friends use it and are fine. Hello dear tomorrow. Is there any BB cream on the market for oily skin?? I really need something matte, but not as heavy as foundation... suggestions?? I've heard there's one from rimmel, but there aren't many bb creams suitable for oily skin, since most of them are moisturizing and brighting, I suggest trying a bit of mattifying moisturizing with a light foundation, mix the two and get your own bb cream! Hello dear,you have so lovely blog!i am your new follower on gfc and blogloving,would you like to follow me back? Yo esta no la he probado uso otras y no me va mal, pero no es igual que un maquillaje desde luego!! Nunca la he probado pero he oido hablar muy bien de ella! I haven't tried that one, luckily! Thanks for this post! Sorry to hear this product didn't work out for you. I tend to find that Asian BB creams work better for me. I will put that into consideration when purchasing bb cream! My foundation is from Rimmel and I love it, It's "Stay Matt", and I was thinking on buy that BB cream, but fortunaly I didn't. Nice review dear. I was thinking of buying it, but you saved me. I have oily skin seems it wont be suited for me.